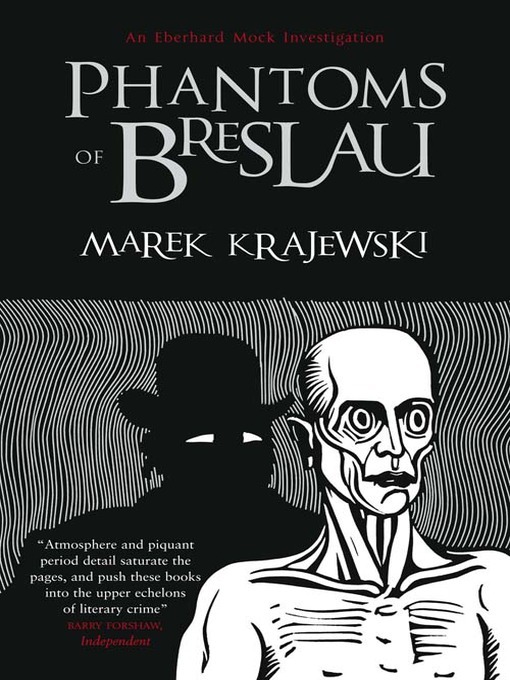 Can anyone answer a question about Marek Krajewski's tremendously entertaining Breslau series: each novel is set further in the past than the previous novel in the series, and my question is, how far back has he gone in the Polish originals? With the arrival of Phantoms of Breslau in English we have arrived in 1919, with flashbacks to the World War, and Krajewski has illuminated some of the mysteries of his detective's life and career. Eberhard Mock is a unique character in crime fiction, and his personal demons have been a major factor in the series. In Phantoms, they're the key to everything. The mutilated bodies of four sailors (more likely male prostitutes in sailor garb) open a case that pushes a haunted Mock to the brink of both love and death. His nightmares are making him attempt to stay constantly awake, and his father (with whom he is living) is haranguing him about his drinking (being drunk is the only respite from his sleeping horrors). Even worse, everyone he interviews in connection with the four sailors seems to be next in line for the killers, leading the police chief to remove him from the case. Mock's guilt over the deaths lead him to take extravagant measures to protect everyone with whom he speaks. In two cases, those protected witnesses are young prostitutes (of the female variety) who have touched him, in different ways. Another thread of the book consists of the increasingly insane musings of the murderer, who is involved in a spiritualist cult, the tenets of which are discussed in the killers rantings. The identity of the killer, however, is concealed until a very literally tortuous conclusion. Krajewsk's novels are violent, but in a uniquely decadent and symbolic fashion. The works have a loopy structure that mirrors Mock's state of mind. The overall effect is compelling. I had almost finished Phantoms when I left for a 10-day vacation, and not wanting to haul around a book I'd finished from town to town in Italy, I left it until I returned home. 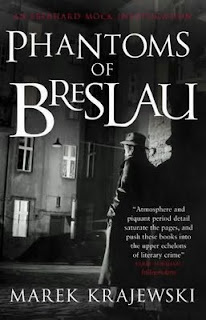 I worried a bit that I'd have a hard time getting back into the story, but I needn't have: Krajewski's crime-fictional world is so vivid, and his reminders to the reader so carefully laid out, that I was instantly sucked back in. You don't hear the word "louche" much any more, but the Mock series calls the term to mind (if I remember correctly what it means). These are stories of corruption, decadence, depravity, and cruelty. 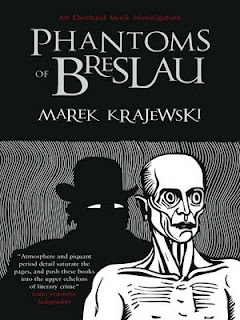 All of the above in an engaging and entertaining way, leaving the reader anxious for the next (and at the same time previous, given Krajewski's unique way of creating a series) book to arrive. I'm pasting in two covers, apparently alternates rather than U.S. or U.K. versions. The more stylized one is the one actually published by McLehose in the U.K. and is by far the better one. 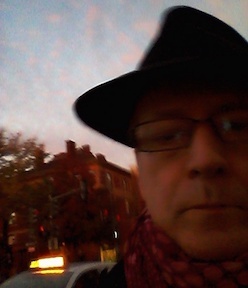 The other, showing a fedora'd detective lurking in a cityscape, is wildly inappropriate to the era of the novel and the headgear of Mock. i don't know the answer (and haven't read these books) but you could check out Euro Crime or ask Karen; or Norman (Crime Scraps) might know as he has read/reviewed these.